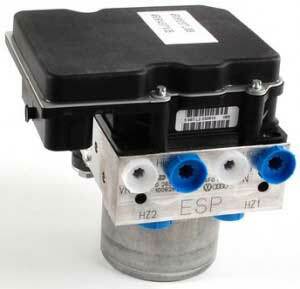 Many modern Audi’s are fitted with the new Bosh 8.0 ABS/ESP pump module. This is the latest Bosch ABS / ESP pump technology and is found fitted to a variety of cars including: BMW, Nissan and Mercedes-Benz and surprisingly is already a very common failing part. When the Bosch 8.0 ABS pump fails, most workshops will advise on a new replacement unit which can only be purchased from a main dealer and carries a very expensive price tag. The new replacement units will also require coding which would be an additional cost. Whilst it may seem tempting to opt for a second-hand used replacement to reduce cost, the life expectancy will be reduced compared to a new or re-conditioned ABS unit and it will still require coding at an additional cost. Below we have compiled a short list of Audi’s we have seen fitted with the Bosch 8.0 ABS / ESP Unit. This is not a complete list and there are model specific variations so don’t worry if your vehicle is not listed. If you’re not sure you can always call us with your vehicle details and a brief description of the fault along with any fault codes you might have and we will do our best to help. Our highly trained and well experienced team are able to fully test & repair the Bosch 8.0 ABS / ESP unit fitted to Audi’s and we use new genuine OEM components to ensure that every rebuilt pump meets & exceeds OE specifications. All of our remanufactured units come with a Lifetime warranty and are fully plug & play – meaning they will not require any coding / programming when re-fitting to the vehicle. We can also offer a professional diagnosis & fitting service if required. See below for some of the most common failing part numbers associated to the Bosch 8.0 ABS / ESP units. If you don’t see your part number – don’t worry, this is not a complete list. Simply give us a call on 0844 847 9999 to speak to one our team members who will be able to assist you with any queries you have. Tags : 0265230017, 0265230289, 0265230304, 0265230373, 0265230686, 0265231425, 0265231426, 0265231450, 0265231452, 0265231537, 0265231579, 0265231617, 0265231672, 0265231712, 0265233337, 0265234035, 0265234075, 0265234095, 0265234097, 0265234114, 0265234148, 0265234212, 0265234227, 0265234260, 0265234263, 0265234336, 0265235054, 0265235097, 0265235103, 0265235394, 0265235406, 0265236310, 0265239000, 0265800362, 0265800363, 0265800375, 0265800376, 0265800377, 0265800422, 0265800441, 0265800461, 0265800495, 0265800511, 0265800579, 0265900324, 0265950318, 0265950338, 0265950351, 0265950353, 0265950360, 0265950372, 0265950407, 0265950414, 0265950429, 0265950430, 0265950474, 0265950505, 0265950545, 0265950557, 0265950742, 0265950749, 0265950824, 0265950962, 0265950986, 0265951, 0265951048, 0265951738, 0265955000, 10330U0213, 110403-2-0661, 13236012AQ, 21351771148, 2233451676205901, 3451676882901X, 44510-0H010, 4454005071, 445400F030, 47660-JD01DX, 4A90AL1799, 4F0614517AAX, 4F0614517BOJX, 4F0614517D, 4F0614517KX, 4F0614517L03X, 4F0614517LX, 4F0614517NX, 4F0910517AD007X, 4F0910517DX, 4F0910517KX, 4F0910517L009X, 4F0910517LX, 504075551, 504075553, 51761005, 553015, 5532809, 55831, 57110SMGG012M1X, 676882901, 6Q0614117LX, 6Q0614117QX, 6Q0614117SXX, 6Q0614417HXX, 6Q0614417MX, 6Q0907379ABX, 6Q0907379R0003X, 6Q090737R0001X, 6R0614517HX, 6R0907379EX, 6R0907379HX, 77BO2AAY2, 8200192202, 8E0614517BDX, 8E0614517BFX, 8E0910517AK05X, 8E0914517D012, 93188091, 9660934580, 9674677580, 9676244880, A0004468289X, A0054319512X, A0064316312X, A2124312912X, A2129006201X, A4544202275X. Hi my customer has a 2006 Audi A6 2.4, typ 4f front wheel drive with an ABS problem. We are in the Philippines, I would like to ask how much would repair of the ABS unit be, how much would freight cost and how do we go about sending the ABS to you. We have seen both faults before and have been able to repair them. I have sent you an email with full pricing and information. I have 05 Audi 2.4 V6 Automatic. I scanned with VAGCOM tool and as I’m having fault code- Brake Pressure Sensor 1 (G201). Part number is 4F0614517K. Please let me know how much the part and how long will it take to rebuild? I’ve just sent you an email with full pricing and information for this type of repair. Can you fix this abs module? How long can use it after repair? And I wannt to know the price of a new module. We’ve sent you an email with full pricing and information including turnaround time. The unit will be returned to Thailand with a Lifetime warranty. HI GUYS, I am korean. cost , shipping is korea? In uk Lincolnshire i think my audi a6 module has gone how much to repair please?